TGPRPLUSMINUSVIPERATEMJAWSPROWP….Alpinestars may not be the best at coming up with easy to decipher names, but that doesn’t change the fact that they consistently put out a well made, well fitting, high quality product. This is why we have high expectations for the new for Spring 2015 T-GP R Air and T-GP R WP. 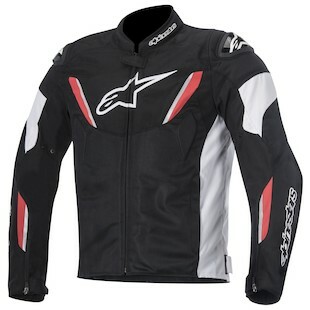 The Alpinestars T-GP R Air Jacket comes equipped with mesh panels on the torso, back and triceps. 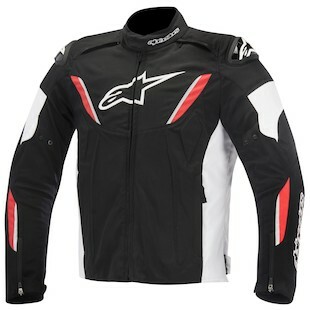 This will make a great summer jacket and should be a wonderful compliment to any of the Alpinestars mesh riding pants. Constructed with a 450 Denier fabric chassis, stretch fabric in the sleeves and accordion stretch bellows in the shoulder and neck areas, this is a comfy jacket that is beefy enough to take on the highway. Double waist adjustments, and sleeve volume adjustments at the wrists and biceps allow you to further refine the fit. Upping the game even further are shoulder sliders, a feature previously only seen on their leather jackets. Both versions of this new jacket will come standard with dynamic control vents on the shoulders and an elongated rear profile that will keep your lower back covered while in the riding position. The Alpinestars T-GP R WP Jacket (the waterproof version) is built pretty much the same, and it features a textile exterior and a removable waterproof liner. This liner, coupled with the high flow shoulder air intakes, should make this a very versatile jacket for cool to warm temperatures and of course, wet weather. Pair this jacket with any waterproof Alpinestars pants and you will be ready to rock and roll, rain or shine. Alpinestars is a RevZilla favorite, a powerhouse in the industry, and one of the best known names in motor-sports. If you are in search of a reasonably priced, high quality and functional jacket for summer or wet weather riding, the T-GP R Air and T-GP WP should be high on your list.